Retailers are making food avoidance easier for the tens of millions of Americans that restrict gluten, peanuts, tree nuts, shellfish, milk, eggs, wheat, fish and/or soybeans from their diet. Seattle-based PCC Natural Markets integrates its 3,700 gluten-free SKUs with other products and highlights them with orange-colored shelf tags for easy shopping. Although it doesn’t have a process in place to identify foods that are free of the eight most common allergens, it makes a conscious effort to minimize cross-contact within its prepared foods department, and staff members are trained in the ways they can help shoppers avoid allergens, said PCC Nutrition Educator Nick Rose, MS.
“All PCC staff are trained to provide outstanding customer service and most staff are very knowledgeable about food allergens and reading food labels,” he said. The Food Allergen Protection Act of 2004 requires that labels clearly identify the food source names of all ingredients that are — or contain any protein derived from — peanuts, tree nuts, shellfish, milk, eggs, wheat, fish or soybeans. In addition, PCC “offers free in-store classes with a team of nutrition educators who are credentialed with a graduate degree in nutrition and are able to help shoppers find foods and products that meet their special dietary needs,” said Rose. PCC’s experts are fielding more questions related to children and allergies, and recommend nut-free alternatives such as pumpkin seed butter or tahini to those packing nut-free lunches. 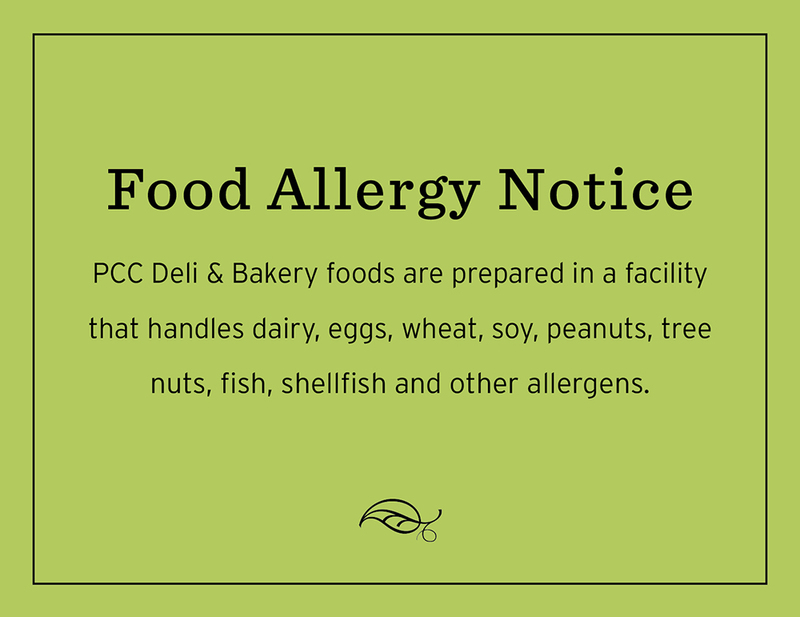 PCC also has a policy against using nuts as an ingredient in recipes prepared during kids’ cooking classes due to the high allergy rates in that age group. Food allergies in children jumped 50% between 1997-1999 and 2009-2011, said Scott Riccio, SVP of education and advocacy at McLean, Va.-based Food Allergy Research and Education (FARE), which works on behalf of the 15 million Americans with food allergies. The growing prevalence of life-threatening food allergies in children and restrictions related to peanuts and tree nuts in schools are influencing retailers’ strategies. West Des Moines, Iowa-based Hy-Vee caters to the needs of parents of children with allergies as well as those with children who attend nut-free schools. “During major school holidays such as Halloween, Christmas and Valentine’s Day, Hy-Vee adds shelf tags to candy and snack items to indicate which are nut free,” noted Hailey Boudreau, RD, LD at the Ankeny Prairie Trail Hy-Vee in Ankeny, Iowa. To qualify for a tag, an item must be free of nuts and processed in a facility that does not process nuts. “Store dietitians also promote nut-free, classroom-friendly recipes throughout the store, within schools and on social media,” added Boudreau. In addition, her store provides recipe kits for parents and schools that include ingredients that are free of the major allergens and can be prepared in the classroom. 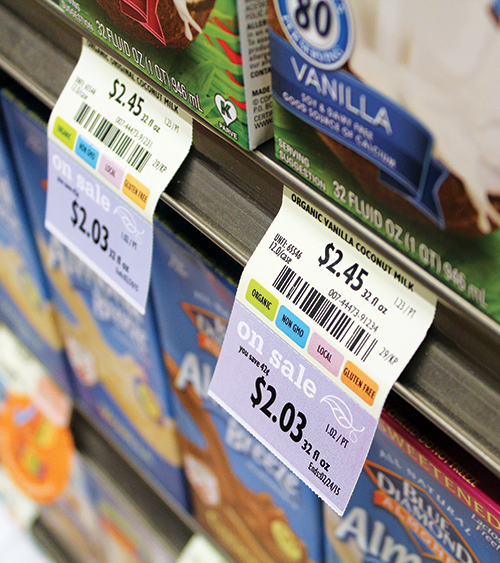 “While there’s no one-size-fits-all approach for grocers, one universal strategy should always be to have clear and consistent labeling that accurately provides the shopper with the information they need to make an informed decision about whether or not a food is safe for them,” suggests FARE’s Riccio. PCC does this by posting signs letting shoppers know about potential cross-contact in its deli department. It also educates staff and shoppers about potential cross-contact that may occur between foods in the bulk bins, from which wheat flour, peanuts, tree nuts and soy products are merchandised. Although growth has slowed in recent years, the market for gluten-free items is on the rise with the category skyrocketing 178% to $13.7 billion from 2013 to 2016, according to a Mintel report released in October. The percentage of Americans who are consuming gluten-free versions of foods that typically contain gluten likewise continues to climb. Thirty-two percent of respondents to Mintel’s consumer poll reported that there was consumption of gluten-free versions of foods that typically contain gluten in their household, either by themselves or others, up from 24% in 2013. Natalie Menza-Crowe, MS, RD, director of health and wellness at ShopRite, has seen a rise in naturally gluten-free products such as jarred tomato sauce, yogurt, packaged meat and seafood making gluten-free claims. The retailer merchandises gluten-free foods in its HealthMarket department, with most stores having an aisle or section that is completely gluten-free. Foods that are free of the eight most common allergens are also merchandised in HealthMarket and store dietitians call attention to them during store tours. As they become more popular, these options, like allergen-free chocolate chips, will be integrated alongside conventional items in their category, Boudreau explained. Hy-Vee’s in-store dietitians are available to clear up any confusion during free one-on-one consultations. Boudreau finds that the holidays are a popular time for questions about dietary restrictions. In addition to being found on HealthMarket shelves at Hy-Vee, gluten-free items are integrated with conventional items and identified with a “gluten-free” shelf tag elsewhere in the store. “You can find gluten-free dessert options in the bakery, as well as in the pasta and snack aisles,” Boudreau said. FARE’s Riccio recommends that foods restricting the eight most common allergens and merchandised in gluten-free sections be identified with specific signage. 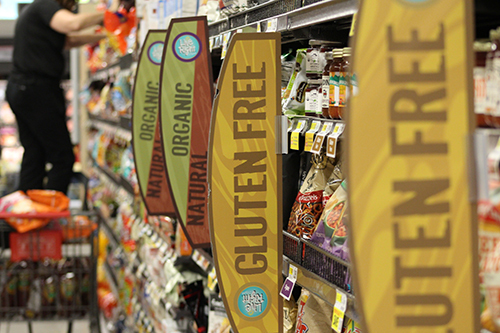 “Because consumers are avoiding different allergens, it may be advisable to mark products/shelves free-from specific allergens [rather than simply shelving them] under the gluten-free signage,” he said. Joel Warady, chief sales and marketing officer at Enjoy Life Foods, which makes foods that are free of the eight major allergens, said that an opportunity exists for retailers who merchandise foods in dedicated free-from sets. Its Baking Chocolates, Soft Baked Cookies, Crunchy Cookies, Snack Bars and Plentils, which are plant-based lentil chips, are its best-sellers. To meet the needs of shoppers with food allergies, Scarborough, Maine-based Hannaford Supermarkets has added an online filter that allows visitors to Hannaford.com to search store-specific inventories for items that restrict products containing ingredients such as peanuts, eggs or wheat. In-store dietitians, said Riccio, are another invaluable resource when it comes to educating consumers who seek to avoid certain ingredients, but retailers should also be leveraging their knowledge to educate store employees and make recommendations about food preparation. “A retail dietitian who is well versed in food allergy management can help consult on ways to prepare foods to minimize cross-contact, and they can also be available to consumers who have questions on how to shop to maintain a healthy diet while avoiding food allergens,” he said. Expert assistance while shopping to avoid certain allergens is crucial at a time when consumers are facing multiple allergies, according to PCC Natural Markets’ Nutrition Educator Nick Rose, MS.
“Many of our shoppers have dietary restrictions, and quite often shoppers have multiple dietary restrictions to work with,” he said. “This includes restrictions to the most common allergens, such as peanut and wheat, but also a growing number of shoppers with other food intolerances. “There is a growing body of shoppers following a low FODMAP diet for IBS that avoids onions, garlic, beans and certain vegetables. We also see many shoppers avoiding all grains, not just the gluten-containing grains. Carrageenan is another ingredient that more and more shoppers are avoiding because of potential digestive concerns that could be considered a food intolerance,” Rose said. PCC does not allow products with artificial colors, sweeteners, preservatives and ingredients such as carrageenan, MSG and Red #40 in its stores since they’re suspected triggers for many people, according to Rose. The retailer offers free in-store classes, with nutrition educators who have graduate degrees in nutrition, to educate shoppers about ingredient avoidance.